Software development is an area that is driving innovation for many different aspects of our lives. Agile methodologies and scrum processes have changed how teams work together and have enabled faster decisions, quicker releases, and early prototyping and testing. This has been necessary to operate in a market where 1) ressources are expensive and 2) conditions are changing rapidly. If you compare agile methodologies with Design Thinking, you might think that the latter one is already present in software development processes. Regarding parallels between these two, Lindberg names “user-centricity”, “iterative learning and development processes” and “extensive team communication” to underscore strong similarities. However, he also sees crucial differences between the two: The focal point of design thinking, according to Lindberg, is to put divergent options on the table and prototype. 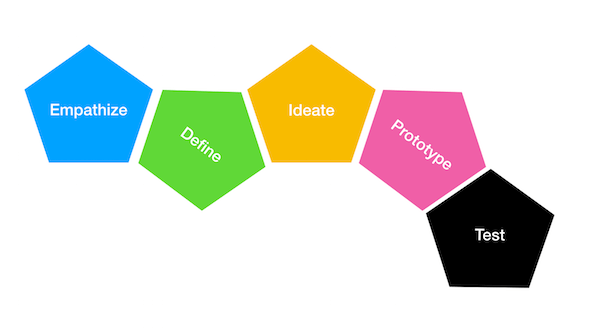 Iterative prototyping is at the core of design thinking. Agile, on the other hands, focuses on the question on what to do next. How to use Design Thinking for software development projects? With obvious differences being present between Agile and Design Thinking, Lindberg also introduces new solutions on how to actually introduce Design Thinking into software development. and the iterative alignment of both spaces: Iteration is what Agile and Design Thinking have in common, but iteration is used to a far greater extent in Design Thinking. How can teams work on integrating these approaches into their workflows? The prototypes of Design Thinking are intended as learning possibilities: the idea is to find a solution without running into the wrong direction for a long time, but the prototype isn’t necessarily related to the final product. Empathize: At the core of Design Thinking is empathy. This step is about understanding the customer, empathizing with their problem, watching, listening, and observing what they are struggling with. For software development this means truly understanding the problem before starting to work on the solution. This can happen, for example, in interviews with potential customers. Define: Defining the problem is the next step. The idea is that framing is crucial when you are looking to find the right solution. How can you frame a user problem? Who are you actually designing for? Who is your user? Ideate: The ideating stage is about generating the broadest range of possibilities. Ideation techniques are brainstorming, sketching, mindmapping, but also prototyping in order to learn and explore more about the problem and the context. Prototype: In Design Thinking you can be building several prototypes at once that help you understand the user better. The idea is not to spend too much time on each prototype, but explore a variety of options. Test: The last step is the testing stage. You are testing your prototypes with users and are getting feedback on them. Key here is to listen and watch as users are exploring your prototypes. Design Thinking is a popular concept that is used to generate creative ideas and solutions. In a time, in which every company is becoming a software company, Design Thinking can help to give dev teams a new perspective on understanding the problem and finding a solution and can be integrated into software development as a precursor to actual software development. Design Thinking raises interesting questions and introduces diversity, creative exploration, and problem solutions.